Each year the Builders Association of the Twin Cities holds an annual Building Industry Gala, known as “The BIG Night” to honor and recognize top builders and trade partners for their excellence in the home building industry. Last Thursday, our Homes by Tradition team is proud to not only have won our 7th Reggie Award℠, for our custom home in Spirit of Brandtjen Farm, but to have also received one of the most prestigious awards of the evening, the 2016 Builder of the Year! These awards would not be possible without the hard work and dedication of our team, quality trade partners, and great customers. We would also like to congratulate our trade partners who took home Trillium Awards℠ for their work and partnership on our Reggie Award℠ winning home: Ambiance at Home Staging, Fireside Hearth & Home, MCI Drywall, Southern Lights and Water Doctors. Thank you to everyone involved – this would not have been possible without you! WHAT IS THE BUILDER OF THE YEAR AWARD? 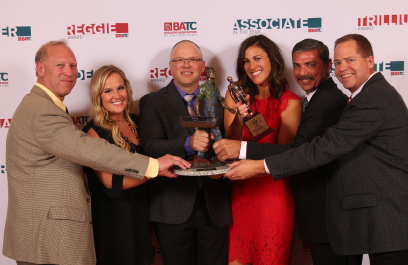 The “Builder of the Year” award is one of BATC’s most prestigious awards. Companies are selected from evaluations of trust, communications, service, ethics and client satisfaction by their trade partners and customers. It is narrowed down to five Builders with the highest scores. From there, the criteria and comments are reviewed by past award winners to determine the new winner. WHAT IS A REGGIE AWARD℠? Reggie Awards℠ are awarded to builders to recognize their outstanding achievements in a series of categories based on design, construction quality, and value of their homes entered into the Parade of Homes®. Each home entered is judged by a panel of other builders and industry professionals that tour each home to determine a winner for each respective price category. For more photos of our Reggie Award Winning custom home – CLICK HERE. This home is open to tour Thursdays-Sundays from 12-5pm.